For time out of mind, bloodthirsty demons have stalked the night, culling the human race to scattered remnants dependent on half-forgotten magics to protect them. Two heroes arose – men as close as brothers, yet divided by bitter betrayal. Arlen Bales became known as the Painted Man, tattooed head-to-toe with powerful magic symbols that enable him to fight demons in hand-to-hand combat―and emerge victorious. Ahmann Jardir, armed with magically warded weapons, called himself the Deliverer, a figure prophesied to unite humanity and lead them to triumph in Sharak Ka – the final war against demonkind. But in their efforts to bring the war to the demons, Arlen and Jardir have set something in motion that may prove the end of everything they hold dear―a Swarm. Now the war is at hand, and humanity cannot hope to win it unless Arlen and Jardir, with the help of Arlen’s wife, Renna, can bend a captured demon prince to their will and force the devious creature to lead them to the Core, where the Mother of Demons breeds an inexhaustible army. Trusting their closest confidantes, Leesha, Inevera, Ragen, and Elissa, to rally the fractious people of the Free Cities and lead them against the Swarm, Arlen, Renna, and Jardir set out on a desperate quest into the darkest depths of evil―from which none of them expects to return alive. 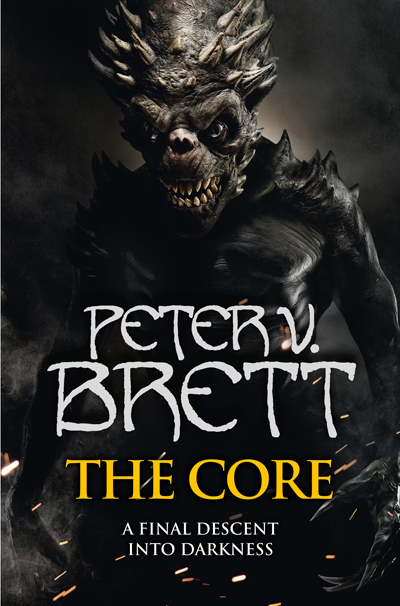 Raised on a steady diet of fantasy novels, comic books, and Dungeons & Dragons, Peter V. Brett has been writing fantasy stories for as long as he can remember. He received a Bachelor of Arts degree in English Literature and Art History from the University at Buffalo in 1995, and then spent over a decade in pharmaceutical publishing before returning to his bliss. He lives in New York.